Conscious and valiant people of Kashmir will never allow letting these sacrifices go waste. May 8 reminds us one the darkest and bloodiest day in the Kashmir’s history of occupation and suppression. 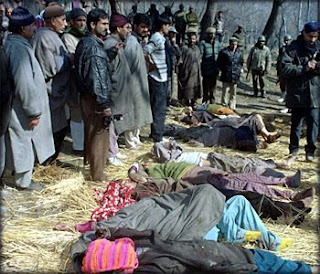 It was on this day in the year 1991 that about 29 innocent people were brutally martyred by C.R.P.F near martyr’s graveyard Khnayar, when a funeral procession of 3 local militants killed in an encounter was going on, trigger happy C.R.P.F personnel run amok and fired indiscriminately at the people adding another day in the long list of bloody massacres in Kashmir. Kashmir’s history is full of such acts were humanity was putted to shame and these are in no way acts of human rights violation but war crimes committed as to spread fear psychosis among people of Kashmir demanding their inherent, pledged, fully deserved and unfettered right of self determination. And it is the denial of this basic right by which peace has eluded and the rein of uncertainty is prevailing in the sub-continent. It is due to the supreme sacrifices offered by lakhs of Kashmiris who gave their red hot blood which took this dispute from cold storage and highlighted it in international arena. Conscious and valiant people of Kashmir will never allow letting these sacrifices go waste. Sagacity and prudence demands resolving this vexed issue in tune with the national aspirations of Kashmiris otherwise its inherent potential can destabilize the peace of whole South Asia.